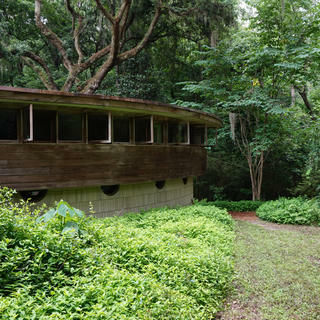 Designed by Frank Lloyd Wright and constructed in 1954, Spring House is the only built private residence designed by Wright in the state of Florida. 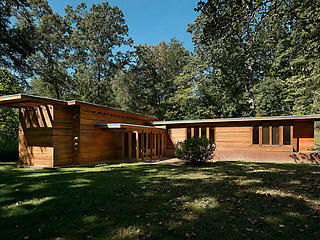 The novel hemicycle form of Spring House represents a late, and little known, stage in Wright’s long, prolific career. Although there are approximately 400 intact houses attributed to Wright throughout the country, only a fraction were from his hemicycle series. 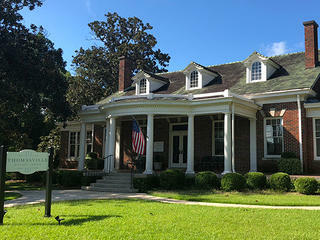 Spring House was recognized as a significant structure and placed on the National Register of Historic Places in 1979, when it was only 25 years old. Spring House is also one of the few Wright properties still in the hands of the original family. Clifton Lewis and her husband, George, sought out Frank Lloyd Wright in 1950 to design a home for them. Members of the Lewis family lived in the house until 2010. Despite its unique design and its association with America’s most famous architect, the house is deteriorating and urgently in need of repairs. Exposure to hurricanes and wind storms has led to water intrusion, and the damage is visible throughout the interior of the house. In addition, tall cypress columns have deteriorated at their bases, and insect and woodpecker damage is apparent on the cypress siding. Spring House was included on the Trust's 11 Most Endangered Historic Places list for 2014.